Bathroom Makeovers That Will Take Your Breath Away! From going through your morning routine to winding down before bed, you end up spending a lot of time in the bathroom each day. If your bathroom has not seen an update since the turn of the century, that can add up to a lot of hours staring at cracked tiles and outdated plumbing fixtures. You deserve a chance to relax in your own personal oasis, so enlist the amazing services of Castle Remodeling for a stunning bathroom transformation. Our fantastic team has been creating beautiful bathrooms for over 30 years, and we take a great deal of pride in the quality of our work. From a small bathroom remodel to full bathroom designs, you can count on our extensive knowledge, unparalleled skills, and solid work ethic to complete your project in no time at all. 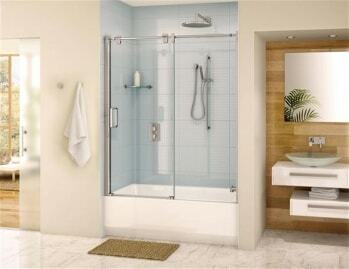 We use Fleurco Bathtubs & Shower Doors. From innovative lighting and plumbing designs to bath and shower remodel services, the experts at Castle Remodeling provide everything you need for a complete bathroom makeover. Using only the best supplies and most advanced tools and techniques, we’ll turn your outdated bathroom into one of your favorite rooms in the house! Our designers always keep up with the latest trends and know how to maximize space and comfort while paying close attention to your budget. If the existing bathrooms in your home are too small for your family, don’t move—remodel! When you hire our team at Castle Remodeling, our amazing designers will sit down with you to discuss all of your bathroom remodeling options and budgetary requirements. Once we configure a remodeling plan you love, we can begin your project! All bathroom remodels take about two to three weeks to complete, and one of our owners or professional crew members is always on-site to answer any questions you may have. Castle Remodeling has a full team of experienced professionals that take ordinary bathroom designs to a whole new level with custom and semi-custom cabinetry and flooring. We offer a wide range of cabinets in every size and color to maximize storage options, as well as beautiful bathroom sink and vanity combinations. Top everything off with intricate stone or tile work, and you now have a gorgeous new bathroom that perfectly fits your signature style. We are proud to offer custom and semi custom cabinets. Work with a team you can trust when you hire Castle Remodeling. The only limit to what we can accomplish is your imagination, so bring us your ideas and we will help you create the bathroom of your dreams. Free estimates are available for all our services, so contact our Agoura Hills bathroom remodeling team today at 818-991-0361! Let’s get started on your bathroom remodel! Call (818)-991-0361 today!